Registrar’s Official Grade Distribution Report – The Course Grade Distribution Report is a detailed aggregation of final grades given in each course and section. For courses with more than one section, the report also provides totals for all sections. Department, college and university totals reflect composite grade distributions. Course grades of D, F, or drop (after the add/drop deadline) represent an unsuccessful course outcome. Tabulations of D, F, Drop rates by course are provided to help departments understand undergraduate course outcomes and identify bottlenecks to degree progression. 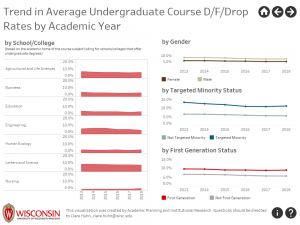 Click on the Tableau dashboard below to access a workbook showing undergraduate course D/F/Drop rates over time, by several demographic characteristics, and compared to other departments. From 2002 to 2009 APIR provided this report to school/college deans offices at the request of the UAPC. As a result of a 2001 study of grading patterns, the UAPC requested that this report be distributed to deans offices to help them identify large classes that had multiple sections and that had a grade disparity among those sections.